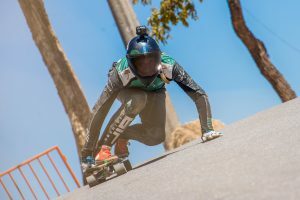 Carlos Paixao - Photo: Luciano Lima Jr.
Thiago Lessa - Photo: Luciano Lima Jr.
On a closed track like Mega Grand Prix, where 11 qualifying runs were done in one day, it is all about your strategy. The colder the track gets the faster it is, so everyone saved the best for last. 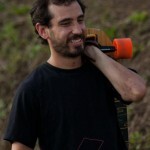 Carlos Paixao, as expected, set the pace from the first run, positioning himself on first place all through the day. World Cup title contenders, Thiago Gomes Lessa and Max Ballesteros followed close behind during the day, but at the end of the afternoon when the shadows took over the track cooling it, everyone started getting faster and fresh wheels were set up to make the last runs count, in which most of the riders improved their time. William Rubim and Thiago Gomes Lessa in their last run joined the 1:14 club with leader Guto, closely followed by Tiago Mohr and Douglas Silva to complete the top five qualifiers. Melissa Brogni led the ladies with a big advantage, Jennifer Schuarte from Germany is her closest rival for tomorrow at 4 seconds behind. Juniors was a close fight between last year Champion Jeremias Gasparotto and Gabriel Drachemberg with less than a second of difference between them in every run. 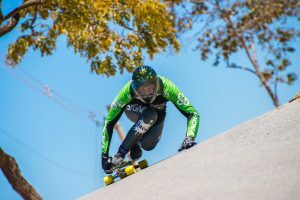 Masters was also an exciting face off between Rafael de Campos Dobner and Leonardo Discacciati, the latter who was second all day, snatched the first place in the last run of the day by three hundreds of a second. It was a very exciting day here in Santa Luzia, which gave us a glimpse of tomorrows competitive race which will takes on step closer to the World Championship. Full grip at Mega Space track - Photo: Luciano Lima Jr.